Alma was born in 1991, just one year before her hometown of Bihac fell under a 3-year-long siege during the 1992-95 war in Bosnia and Herzegovina. 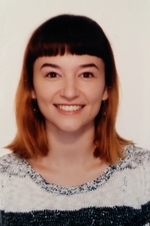 She graduated from University of Sarajevo with a BA in English Language and Literature and Sociology, and she is currently pursuing an MA in Translation Studies and Sociology. Her areas of interest are gender equality, gender-based violence and wartime sexual violence related to Bosnian society and the country's turbulent history.